Additional Info: SKY Q WITH MOVIES PACKAGE. Payments Made Via Bank Transfer. Deposit Taken following agreement of Terms & Conditions, on receipt of Booking Forms. Remainder of Balance to be paid 6 WEEKS prior to date of Holiday. £75.00 Non Refundable Deposit required to secure dates. A Security deposit of £100.00 is also required when Booking in case of damages. This will be refunded 48 hours after your stay once inspection of Caravan has taken place. Booking will only be accepted if the hirer is at least 21 YEARS OLD. Family Groups Only, NO Hen/Stag parties. NO Pets or Smoking in this caravan. Holiday Park Activity Passes can be purchased at Reception on your Arrival. Linen provided for duration of stay. Last Minute Bookings must be paid in Full. How many people the booking is for. 2018 Platinum Atlas Image 5. This Spacious Three Bedroom 6 Berth Luxury holiday Home, has Open Plan living with free standing Furniture. Full central Heating, Radiators & Towel Rails. Double Glazing. 40" Smart Television/ Sky Q with Movie Package in the Lounge. DVD player/Films. Sockets with USB Ports. Full Size Integrated Fridge Freezer. Gas Oven, with Grill, electric ignition. 5 Burner Hob with recirculating extractor fan. Toaster, Kettle & Coffee Maker. We provide - George Foreman, Air Fryer & Slow Cooker. Full range of Utensils, all you need. Bathroom - Full size Walk-in Shower. Towel Rail, Toiletries Provided. King-size Bed, Full size Walk-in Wardrobe with sensor light. Twin rooms both have plenty of storage good size Beds. Patio Area with Picnic Bench. Spacious Lawn Area around the Caravan in private garden enclosure. Wrap around Decking. Sit and watch the world go by, with a Nice Glass of Wine. Everything you need to have a wonderful Holiday is provided for YOU, so that you can just enjoy your holiday. We Provide - Tea, Coffee, Sugar & Milk on your arrival. Travel Cot, Bed Guard & Highchair available on request at no extra cost. SORRY NO PET'S OR SMOKING ALLOWED IN THIS CARAVAN. Linen Provided for Duration of your Stay. 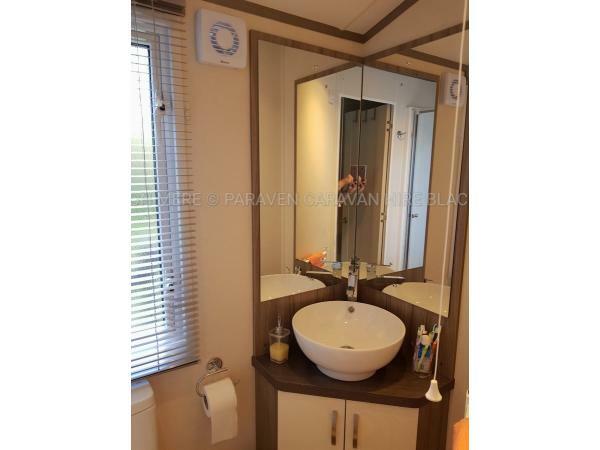 You can also see more Pictures on our Face Book Page - Marton Mere, Paraven caravan Hire. Additional Info: New Lazy River for 2018 Season. A big thank you to the lovely Rita and Anthony the owners who greeted us when we arrived. We had a lovely time in your brand new caravan. Everything you could possibly need for a self catering holiday was there. The welcome basket was a wonderful personal touch and much appreciated. Thank you for sharing your brand new holiday home. We will definately be back and recommend to our friends. We were met by Rita and Anthony who showed us around there beautiful caravan explaining where everything was. The caravan was spotless very clean inside and out. They even gave us a basket with goodies in what a lovely touch my son loved the sweets! Overall we had a fantastic stay would highly recommend this caravan we will definitely be returning next year if available ???? Thank you Tony so nice to meet you and your lovely family. Was great to hear from the children what a fabulous time they had at the site and Blackpool. Regards to you all. As we arrived at the caravan we were met by Rita and Anthony who showed us around their beautiful caravan. It was immaculately clean with every home comfort you could possibly need, including a basket of goodies and treats. The beds were extremely comfortable, and the master bedroom was very spacious for a caravan. Outside the caravan we loved the little private garden area - lovely to bbq on. The location on the park was also excellent, only a couple of minutes walk to the entertainment complex yet still lovely and quiet. We will definitely look to book this caravan again if we return to Marton Mere! Catherine, thank you for your lovely words. We are so pleased that you enjoyed our holiday home. We would welcome you and your lovely family back anytime. Thank you for you written review in our guest book. Thank you so much for taking good care of our holiday home. You are a lovely family, we would love to welcome you back. So happy that you enjoyed your stay. Stunning caravan in an excellent location. A fantastic warm welcome with a lovely welcome basket just to put the top hat on it. The caravan was brand new, spotlessly clean with everything you could ever want (including sky tv). Outdoor decking with rattan furniture was great to sit out and have a drink in the evening. We will definitely be back soon. Thank you Lee lovely to meet you all. Hope you all come back. We took two of our grandchildren with us. Lovely new caravan. Very warm welcome by the owners. The best Welcome Basket ever! So many goodies. Good position for the caravan. Close enough to the amenities to walk. Not too far from the beautiful nature reserve. But not too close to be noisy. Lovely sized private garden (Not the usual bit of a strip down the side). Would definitely recommend. Thank you for a lovely review, lovely to meet you all. So glad you enjoyed your stay. Thank you so much, you were our first official guests are you were great. Please come back see us again.